Verve Coffee Roasters is in a small stucco shopping center on 41st Avenue, a sun-baked Santa Cruz street that surfers use to get to the beach. I first stopped by Verve in 2009 because David Kinch, the Michelin-starred chef of Manresa, is a regular, and after downing an immaculate macchiato and picking out a couple of bags of whole beans I was reminded of how the Left Coast still has it, that a roaster in a tiny storefront thatâ€™s a five-minute walk from the ocean and just down the block from a destination taqueria can turn out some of the countryâ€™s most remarkable coffee. Even though Verve has a national following within coffee circles, it was nearly impossible to find in New York. Which is why I was excited when Rich Nieto at Sweetleaf in Long Island City told me last month that he started to stock it at his coffee shop. Santa Cruz has come to Queens. Oliver StrandThe bean shelves at Williamsburg’s Marlow & Sons carry not just Stumptown but also San Francisco’s Sightglass and George Howell’s coffee brand Terroir Select. 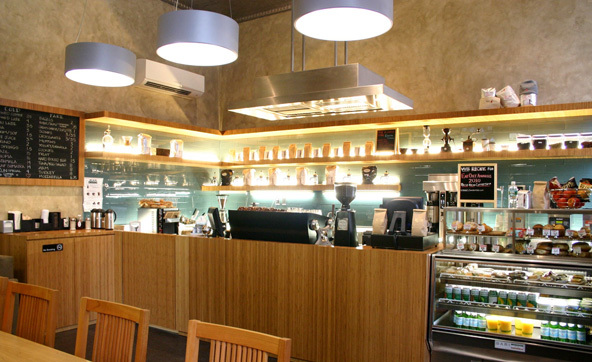 It makes Sweetleaf a rare specimen within coffee, a multiroaster establishment. Stumptown Coffee Roasterâ€™s Hair Bender is still the house espresso, but the pour over bar has a changing roster of Stumptown and Verve coffees. (Whole beans from both roasters are also for sale.) Sweetleaf now offers a single-origin espresso, Verveâ€™s Los Angeles Reserve from Costa Rica. Last week I had a shot that was crisp and clean, bright but not aggressive. An espresso for spring. Itâ€™s more unusual for a coffee shop to switch it up like this than the casual drinker might realize. If a bar wants to sell different beers or whiskeys the manager simply gets in touch with his or her distributor. Itâ€™s one call, one delivery, one transaction. But thereâ€™s no central supplier for coffee, and if a shop wants some variety it needs to place multiple orders, track shipments. Itâ€™s not a lot of extra work, but itâ€™s more than just one-click shopping. Most donâ€™t bother. Besides, thereâ€™s no guarantee that a shopâ€™s customers will be tempted to pick up coffee beans from an obscure roaster from a beach town. Itâ€™s a question of audience. Does Sweetleaf have enough Verve-curious customers to justify the hassle? Is Queens ready for Santa Cruz? Maybe. Even if Sweetleaf isnâ€™t the only multiroaster coffee shop in New York â€” Culture Espresso Bar in Midtown, Kaffe 1668 in TriBeCa, Third Rail Coffee in the West Village (Intelligentsia and Stumptown) have been doing it for some time â€” itâ€™s one of just a handful. Recently, Marlow & Sons in Williamsburg, Brooklyn, also started carrying different coffees. 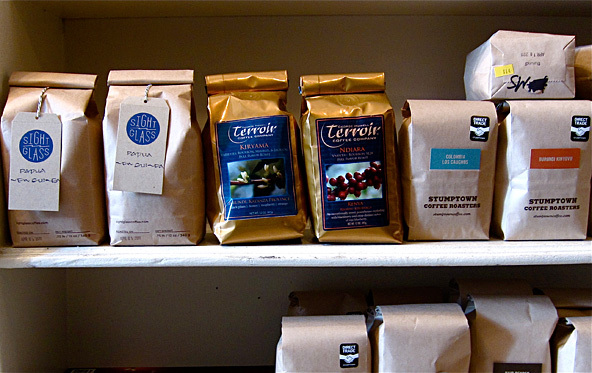 Now Stumptown shares shelf space with Sightglass Coffee from San Francisco and Terroir Select Coffees, a roaster in Acton, Mass., owned by the legendary George Howell. Cora Lambert The interior of the TriBeCa coffee shop RBC NYC. Arguably, the most ambitious multiroaster setup in New York is found at RBC NYC in TriBeCa. In a show of bravado, there is no house brand. Instead, the shop is supplied by an honor roll of small-batch roasters drawn from across the continent: Barismo(Arlington, Mass. ), Brown Coffee Company (San Antonio, Tex. ), Counter Culture Coffee (Durham, N.C.), Heart Coffee Roasters (Portland, Ore.), Klatch Coffee(Southern California), MadCap Coffee Company (Grand Rapids, Mich.), Ritual Roasters (San Francisco), 49th Parallel Roasters (British Columbia, Canada). On any given week, RBC NYC carries about 10 different coffees split between three or four roasters. All this work is the labor of love of Cora Lambert, the Director of Coffee at RBC NYC, who says sheâ€™s driven by ideology. â€œI wanted to bring to New York coffees you couldnâ€™t get here,â€ she said. â€œIâ€™m a fan of the underdog. I wanted to serve seasonal coffees from microroasters â€” small batch, quality beans, really solid purchasing practices.â€ Cult roasters with a conscience. Although it might be easier to find small-batch coffee in New York, timing is important. Not long ago I was fixated on trying coffees from MadCap, a tiny roaster founded in 2008 thatâ€™s been drawing praise within the coffee world, but every time I stopped by RBC NYC the pickings were slim. Then I figured it out: as a rule, coffee is often roasted on Mondays, and because of shipping the bags donâ€™t arrive until later in the week. The sweet spot for out-of-town roasters tends to fall on Thursdays and Fridays, when the shelves are full of plump bags of fresh beans.